In situ optical and biogeochemical in- and above-water measurements are critical for calibration and validation of satellite ocean colour radiometry data products, and for refinement of ocean colour algorithms. During the SeaWiFS era, NASA commissioned the development of a series of ocean optical measurement protocols (see NASA Ocean Optics Protocols for Satellite Ocean Color Sensor Validation) which have served as international reference standards ever since, and have promoted the collection and assembly of climate quality, ocean optical datasets by the global ocean colour community. Since publication of the last revision in 2004, there have been major advances in instrumentation and observing capability, so these community-vetted protocols need to be revised to account for new, emerging, and planned capabilities and modes of deployment. Over the past few years NASA has sponsored several international workshops with experts (including breakout workshops at the International Ocean Colour Science meetings), to update and develop new community consensus protocols for ocean colour sensor validation. The newly drafted protocols will be made available to the international user community on this webpage for a period of time for testing, public comment and review, before they are accepted as international reference standards. Once accepted, the protocols will receive a publication date and version number (e.g., v1.0), and will also have a digital object identifier (doi). These revised protocols will be revisited periodically to determine if enough changes have taken place to warrant a significant update, in which case a new version number will be assigned. Inherent Optical Properties Measurements and Protocols: Absorption Coefficient (v1.0) is a document that serves as a comprehensive overview of calibration, measurement and analysis protocols for the state-of-the-art technologies that measure the absorption of particles in the water or on a filter pad. Chapter 1 provides a detailed overview of the absorption coefficient of pure water, colored dissolved matter and particles along with the current state-of-the-art pure water absorption coefficients, uncertainties and temperature and salinity corrections. Chapters 2–4 provide detailed protocols for measuring particles in suspension using the reflective tube absorption meter, the integrating cavity absorption meter, and the point-source integrating cavity absorption meter. Lastly, Chapter 5 describes the most up-to-date methods for the measurement of absorbance and the computation of absorption for particles on a filter pad using the transmittance method, transmittance method with fiber optics, the transmittance-reflectance method and inside an integrating sphere. Chapters 1, 2, and 5 represent updated versions of those found in Ocean Optics Protocols for Satellite Ocean Color Sensor Validation Revision 4, Volume IV (Mitchell et al. 2002). Chapters 3 and 4 are new contributions to the protocol. IOCCG Protocol Series (2019). Beam Transmission and Attenuation Coefficients: Instruments, Characterization, Field Measurements and Data Analysis Protocols. 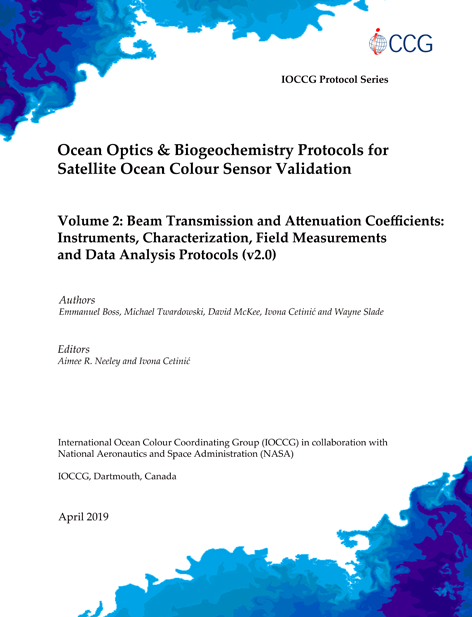 Boss, E., Twardowski, M., McKee, D., Cetinić, I. and Slade, W. IOCCG Ocean Optics and Biogeochemistry Protocols for Satellite Ocean Colour Sensor Validation, Volume 2.0, edited by A. Neeley and I. Cetinić, IOCCG, Dartmouth, NS, Canada. Download File: Beam Transmission and Attenuation Coefficients: Instruments, Characterization, Field Measurements and Data Analysis Protocols. Inherent Optical Properties Measurements and Protocols: Beam Transmission and Attenuation (v2.0) is a document that serves as a comprehensive overview of beam transmittance concepts and the calibration, measurement and analysis protocols for the state-of-the-art technologies that measure the attenuation of dissolved and particulate matter in water. Section 1 provides a detailed overview of measurement concepts and governing equations to derive the beam attenuation coefficient. Section 2 details the design characteristics of common transmissometers. Section 3 describes methods for the characterization and calibration of beam transmissometers. Lastly, this document provides detailed data collection and analysis methods in Sections 4 and 5. This protocol document serves as an updated version of Chapter 2 in Ocean Optics Protocols for Satellite Ocean Color Sensor Validation Revision 4, Volume IV (Pegau et al. 2003). The protocol document entitled “Protocols for Satellite Ocean Color Data Validation: In situ Optical Radiometry” aims to support the ocean color community with protocols for the collection, processing and quality assurance of in situ measurements of the apparent optical properties of natural water for the validation of satellite radiometric products. In addition to a general introduction on Elements of Marine Optical Radiometry Data and Analysis (Chapter 1), the document addresses Radiometers Specifications (Chapter 2), Calibration and Characterization of Optical Radiometers (Chapter 3), In-water Radiometry Measurements and Data Analysis (Chapter 4), and Above-water Radiometry Measurements and Data Analysis (Chapter 5). The overall structure and content of the various chapters are based on, and benefit from, the Ocean Optics Protocols promoted by the National Aeronautics and Space Administration within the framework of the Sea-Viewing Wide Field-of-View Sensor (SeaWiFS) and Sensor Intercomparison for Marine Biological and Interdisciplinary Ocean Studies (SIMBIOS) programs (Mueller and Austin 1995, Mueller et al. 2003a, Mueller et al. 2003b). It is emphasized that, by recognizing optical radiometry can be heavily affected by the presence of clouds which will unavoidably challenge the quantification of measurement uncertainties, the protocols put emphasis only on measurements performed during clear sky conditions, which are those relevant for the validation of satellite ocean color data products. Finally, it is anticipated that the chapters on in-water and above-water radiometry provide comprehensive details on those measurement methods sharing large consensus inside the community and whose application is strongly encouraged. Conversely, brief summaries are only provided for those methods already well represented by the previous ones or for those methods that may exhibit difficult implementation in a variety of measurement conditions. A new Appendix descirbing On-Water Radiometry Measurements: Skylight-Blocked Approach and Data Processing is open for a 60-day public comment and review period before being accepted as the international reference standard. After this period, the document will be revised based on comments received, formatted, and a final PDF document will be posted onto this website. Please email comments on the Appendix to: aop_comments@oceancolor.gsfc.nasa.gov (deadline 29 April 2019).The Appendix describes a scheme (Skylight-Blocked Approach) that directly measure Lw for the calculation of remote sensing reflectance (Rrs). Appendix: On-Water Radiometry Measurements: Skylight-Blocked Approach and Data Processing – DRAFT open for public comment (Email comments to: aop_comments@oceancolor.gsfc.nasa.gov, deadline 29 April 2019). Inherent Optical Properties Measurements and Protocols: Beam Transmission and Attenuation Coefficients serves as a comprehensive overview of beam attenuation concepts as well as measurement and analysis protocols for the state-of-the-art technologies that measure light attenuation in water. 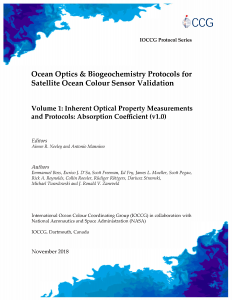 This document represents an updated version of Chapter 2 found in Ocean Optics Protocols for Satellite Ocean Color Sensor Validation Revision 4, Volume IV (Mitchell et al. 2003) and aims to support the ocean colour community with a standard protocol for the collection and processing of in situ measurements of beam attenuation and transmission.